If you still have issues after consulting the guides below please send an email describing your problem to star *at* mit.edu. If there's a problem with a particular step, please include this as well. 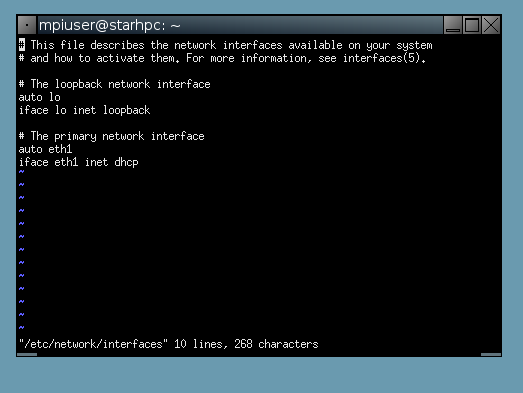 If you're having issues connecting to the internet from within the StarHPC Virtual Machine image on a machine connected to the internet, please read the steps below carefully. Look for an entry named ethX where X is an integer (usually 0, 1, or 2) and jot down the number X. In the image below, X is 1. Press Ctrl-O, and then press Enter to save the file (NOTE: Ctrl-O means hold down the Control key and press the letter “O” at the same time). Next press Ctrl-X within nano to exit nano. The network should now be working. You can test by right-clicking the desktop and selecting firefox. 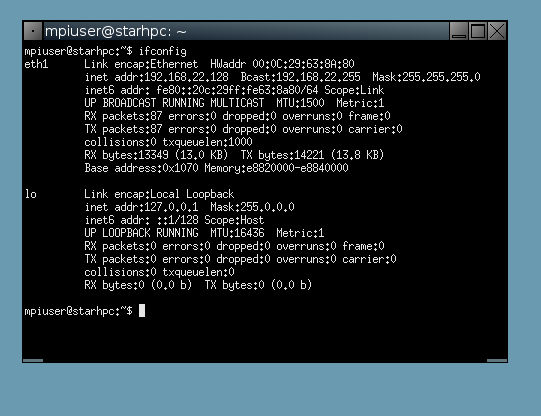 Navigate to StarHPC's homepage to test for internet connectivity.